Rollers and pulleys are key components of horizonal belt filters and belt press filters. Belt press filters use two types of rollers as the upper and lower belts progress through the filtration cycle. 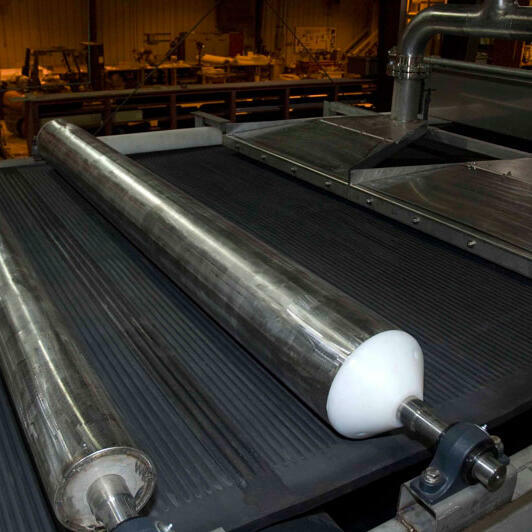 A large perforated roller exerts a gentle and even pressure over the sludge which allows for vacuum pressure to separate liquid from solids in the sludge. 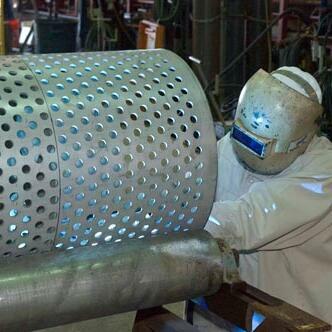 These rollers are made of perforated stainless steel or galvanized and/or Rilsan® coated carbon steel. The high pressure zone in belt press filters consists of a sequence of rolls, from 5 to 15 depending upon the application. The two belts containing the sludge wind around these pressure rolls in an “S” shaped configuration which gradually increases the pressure on the sludge with a consequent rise in final dryness. These rolls are fully coated, including journals and stubs, either by rubber or by Rilsan®. Rollers used on Compositech's horizontal belt filters, provide support for the both the drainage belt and the filter cloth. 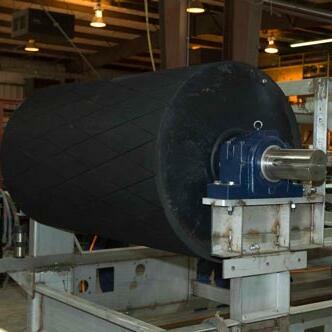 These rollers are usually stainless steel or POPR or rubber covered steel rollers mounted in bearings. The number of rollers required is determined by the length of the horizontal belt filter and the design identified need for support to avoid specific problem areas. Horizontal belt filter pulleys are constructed with a hollow shell, reinforced heads and stub shafts extending into the bearing on each side of the filter. The shell is constructed of carbon steel and the journals can be manufactured from carbon or stainless steel as required. The shell is usually covered with an elastomer suited to the application. The drive pulley is located at the discharge end of the filter and is usually driven by some form of variable speed gear box and motor. For the drive pulley, after the rubber cover has been cured, it is turned round, grooved for the belt ribs, and diamond grooved for increased traction. The tail pulley is the component that applies tension to the belt and its rubber cover is not grooved since it is not utilized to apply motive force to the belt.